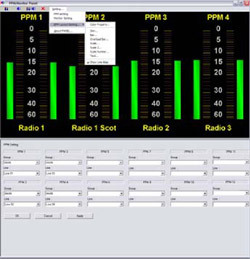 The NTP 660 VMC software (Visual Matrix Control) is a management control software developed for easy control, easy operation and full overview of the complete NTP audio router. The VMC 660 is hosted on a customer supplied PC, which via TCP/IP interface the 625 router control system, the 635 client server and application specific control panels. The VMC 660 control and log all aspects of the NTP router. The 660 VMC features database driven on-line system configuration with full overview of all processes, configurable user interfaces, user rights handling and system supervision, as well as customer specific macro design and macro execution for time controlled cross point settings and easy router control. The NTP VMC offers a comprehensive range of facilities for signal control, signal surveilance and signal handling, including DSP. Signal surveillance can be used for monitoring and as an input for the VMC software to control redundancy switching and alarm indication. 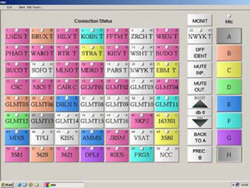 Supplementary to the basic NTP VMC Matrix Control software, various custom designed management solutions are available to meet special broadcast requirements. 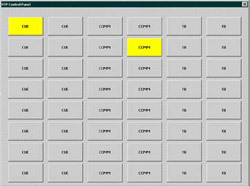 For control purposes, NTP can offer a wide range of touchscreen-based standard panels programmable for different tasks. 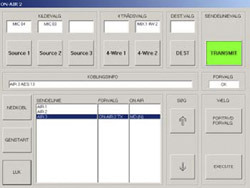 Hardware panels are available with LCD display buttons which can be configured by the VMC control software. The NTP VMC 660 is designed for mouse or touch screen operation. 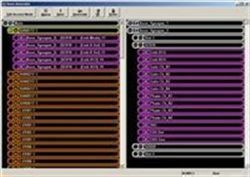 Control Axon Synapse system via the Axon Control Protocol from NTP 660 Specific routing control software including dialogues to read and change parameters in the Axon equipment. Touch screen application8 ”client” touch screens and 56 Conference members allowing upto 8 different setups amongst any or all of the conference members. 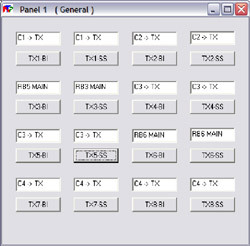 - Application buttons are treated like GPI objects in the NTP625 system that trigger functions e.g. macros.